Once a remote trading site along the Rubicon River inhabited by Potawatomi and Menominee peoples, Hartford has evolved over the past two centuries into a bustling center of industry, recreation, and civic engagement. The Town of Hartford was incorporated as the Town of Wright in 1846. The Village of Hartford incorporated in 1871 and became a city in 1883. Today, the city of Hartford and the independent town of Hartford surrounding it span WASHINGTON and Dodge counties to Milwaukee’s northeast. Spurred by advertisements for arable farmland, settlers like James and Charles Rossman, Timothy Hall, and E.O. Johnson founded Hartford’s earliest businesses, including a gristmill, tavern, and hotel. Agricultural production defined the town’s first retail establishments, from equipment wholesalers to general merchandisers to dry goods dealers. Hartford’s Main Street commercial district retains many of the two-to-three story frame structures housing these original enterprises. To better transport wheat and produce to distant markets, workers began laying track in 1855 for the Milwaukee-La Crosse railroad, which powered Hartford’s economy through the early 1900s. Farmers personally invested in the railroad, though many went bankrupt after salespeople convinced them to purchase faulty stocks secured by their own mortgages. In reaction, farmers created the Hartford Home League which argued against foreclosures and to protect farmers from exploitative railroad practices. 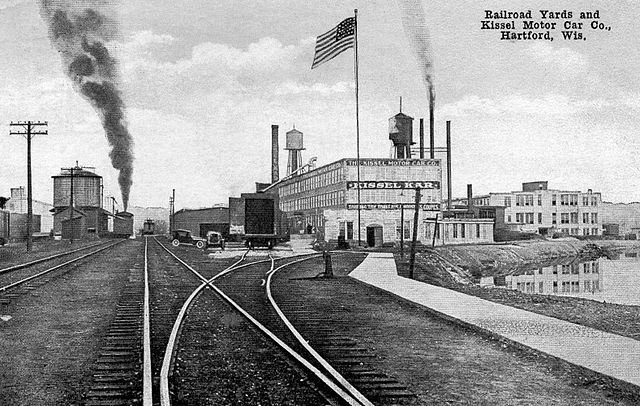 By the early 1900s, Hartford established itself as an industrial producer. After opening in 1906, the Kissel Motor Car Company provided jobs to hundreds of local workers, many of them European immigrants. Kissel built cars, taxicabs, hearses, ambulances, trucks, and other vehicles. The West Bend Aluminum Company purchased the automaker in 1944. West Bend retooled its Hartford plant for wartime production, manufacturing powder tanks, casings, rocket containers, kitchenware, and canisters for gas masks in the 1940s and 1950s. Similarly, the Hartford Canning Company rebounded from a devastating fire in 1918 to become an important supplier of military rations. Another local business, the International Stamping Company, built automobile mufflers, performed light sheet metal stamping, and fabricated truck, bus, and tractor replacement parts. Although most of Hartford’s twenty-first century businesses are service-based, Broan-NuTone LLC continues Hartford’s industrial legacy, manufacturing heating, ventilation, and cooling units. Hartford residents enjoyed a variety of sports and recreational activities. The Hartford Athletic Club held parades, hosted picnics, and organized baseball games and bicycle outings. German-American residents founded a TURNER SOCIETY in 1873. In the 1920s and 1930s, residents established clubs that focused on sportsmanship and conservation, like a chapter of the Izaak Walton League and Community Conservation Club. Hartford also featured a regional baseball team that played in Wisconsin’s Land O’Lakes League. Such activities remain vital to the city of Hartford’s growing middle-class population of approximately 14,200 residents, up from 10,900 in 2000 and 8,200 in 1990. ^ Hartford Centennial Committee, The Heritage of Hartford: Commemorating the Centennial Celebration of Hartford, Wisconsin, 1883-1983 (Hartford: Hartford Centennial Committee, 1983); Laws of the Territory of Wisconsin, together with the Joint Resolutions and Memorials Passed by the Fifth Legislative Assembly at the Annual Session Commencing on the Fifth Day of January, and Ending on the Third Day of February (Madison, Wisconsin Territory: Simeon Mills, Territorial Printer, 1846), 35; Laws of the Territory of Wisconsin, together with the Joint Resolutions and Memorials Passed at the Annual Session of the Legislature in 1847 (Madison: H.A. Tenney, Territorial Printer, 1847), 123; Southeastern Wisconsin Regional Planning Commission, The Population of Southeastern Wisconsin, Technical Report No. 11, 5th edition, (Waukesha, WI: Southeastern Wisconsin Regional Planning Commission, April 2013), 86. ^ Hartford Centennial Committee, The Heritage of Hartford, 8-11. ^ Hartford Centennial Committee, The Heritage of Hartford, 24-26. ^ Hartford Centennial Committee, The Heritage of Hartford, 87. ^ “Remembers Hartford of 70 Years Ago,” The Hartford Times, December 9, 1927. ^ Hartford Centennial Committee, The Heritage of Hartford, 11-23. ^ Finding Aid for West Bend Company Records, 1911-1989, Milwaukee Mss 121, Archives Department, University of Wisconsin-Milwaukee Libraries, University of Wisconsin-Milwaukee. ^ Hartford Centennial Committee, The Heritage of Hartford, 58, 60. ^ “Company Overview,” Broan-NuTone LLC, accessed on February 1, 2013. ^ Hartford Centennial Committee, The Heritage of Hartford, 39-41. ^ “Hartford (city), Wisconsin,” United States Census Bureau, accessed January 2, 2013, http://quickfacts.census.gov/qfd/states/55/5533000.html; City of Hartford, “2009 Annual Report,” 2. Hartford Centennial Committee. The Heritage of Hartford: Commemorating the Centennial Celebration of Hartford, Wisconsin, 1883-1983. Hartford: Hartford Centennial Committee, 1983.